This blogpost is an entry about a new project I'm working on, in the context of the "NONCOMPLIANT FUTURES" exhibit curated by Nicolas Maigret and Maria Roszkowska (disnovation.org) at Musée du Jeu de Paume (Paris). Intriguing animal-machine collaborations and their design have always been relevant to me. Looking back at old entries on this blog, I realize it's been more than 10 years that I started compiling cases of design/art work such as the "pigeon blog" (Beatriz da Costa), or James Auger's "Augmented Animals". In addition, my interest in design fiction/speculative design/new media art has also led me to observe with great curiosity recent projects about synthetic biology, genetically-engineered creatures. Over the years, my fascination towards such cases of interactions between machine and "living beings" have slowly changed. What was at first an interest towards the objectification of non-humans led me to a more thorough questioning of the classic nature/culture divide, and the current ecological crisis. The different projects she discusses in the third chapter of her book can be seen as stories that try to achieve such goals. They reveal how artists, designers and scientists explore (a) the fact that the big divide between nature and culture (or technology) is problematic... (b) that their work – and their ways of doing things – can overcome such opposition, and (c) eventually reveal new imaginaries of a future in the making. New visions of the future that maybe offer a sort of counter-narrative to the discours around "progress" and "innovation" that we always hear about these days. With this theoretical background in mind, I started to revisit my lists and notes about similar projects... and decided it would be relevant to find a way to map such territories. The very fact that it's all about animals, and sometimes plants, fungi and geological elements mixed with technological/synthetic matter reminded me of bestiaries of the Middle Ages. Those descriptive treatise on various kinds of animals have always been interesting to me because of their sort of pre-naturalistic character. The "beasts" were described with lots of anecdotes (often presented with a moralizing tone) and a wide-range of material (drawings, notes, dimensions, weird remarks). Comparing the material I compiled (spreadsheets and textfiles full of links and notes... the kind of things one collect of a computer in the 21st Century) and old bestiaries, I found it would be a relevant metaphor to present the material. Besides that, I may also been influenced by Borges' book of imaginary beings and Claude Maillard-Chary's book about the Surrealists' menagerie. Another interesting aspect of bestiaries lays in the fact that they are never complete and exhaustive. The very idea of a bestiary corresponds to the fact that it should be updated over time... with the help of others. So? I'm currently building this bestiary of hybrid creatures of the Anthropocene. So far, as I said, it's mostly computer files and handwritten notes in my sketchpad. It's quite diverse at this point, with quite different entries: geological material, new media art projects, speculative design cases, or engineering prototypes. It's an ongoing occupation and it would be great to get some suggestion. The fact that Nicolas Maigret and Maria Roszkowska asked me to participate in their "Futurs non-conformes #3" (NONCOMPLIANT FUTURES) exhibit at Musée du Jeu de Paume in Paris certainly helped me to frame the project and I have to thank them for that. Haraway, D. (2016). Staying with the trouble, Making Kin in the Chthulucene, Durham: Duke University Press. Morton, T. (2016). Dark Ecology, For a Logic of Future Coexistence. NYC: Columbia University Press. At some point the Internet of Things is going to look like this: a bunch of discarded plastic artefacts in a flea market. "Crap Futures casts a critical eye on corporate dreams and emerging technologies. It asks questions about where society is heading, who is taking us there, and whether ‘there’ is where we really want to end up." Perhaps the most fascinating entry so far is the one about their critique of "smartness"... which looks quite close to long-time research interests here. "escaping from a big city to a distant island also reminds you of how far we’ve been brought down by technology: how inhuman many aspects of our lives have become, how much we’ve lost or traded away in a few quick swipes. From here on the margins of Europe, what we’re promised by advertisements and political manifestos looks even less shiny than it does in the steel-and-glass centre. We know intuitively that the smart home is not our home; for the margins it’s cast-offs, afterthoughts, crap phones. " Given the news from Las Vegas' CES – with smart fridges among other products that may or may not appear on the now infamous @internetofshit twitter stream – it's definitely wise to adopt a more critical perspective, and I guess Crap Future may be helpful for this. Why do I blog this? This is a fantastic depiction of computing with urban inserts from GTA. What is fascinating here is the way the different visuals create a new form of aesthetic, an alternative near-future world that merges past and present representations. "Space may be the final frontier But it’s made in a Hollywood basement Cobain can you hear the..."
“Space may be the final frontierBut it’s made in a Hollywood basement Cobain can you hear the spheres Singing songs off station to station And Alderon’s not far away It’s Californication” - Red Hot Chili Pepper, Californication, 2009. Btw, I started a tumblr few days ago to accumulate insights, data points and "weak signals" in a very basic/raw way... I use to put that material into delicious but I'm not satisfied with the service anymore. It's called beta knowledge and it can be seen as material that can be turned into long posts here on Pasta and Vinegar, in articles/books/reports, or, even better, into design objects. I'm trying to integrate that into the feedburner RSS feed. "Matiere: Are you interested in Science Fiction? Yuichi Yokoyama: I was impressed by Tarkovski’s films, Solaris and Stalker and also by Kubrick’s 2001, a Space Odyssey. I also like TV shows about aliens and prehistoric times… If one sees Sci-Fi in my stories, that doesn’t bother me, but it’s not specifically my intention. I’m not trying to write stories that are set in the future, but rather to write stories which are delivered from references to any given epoch or time. If the history of the world had turned out differently from what we know today, men would live according to different sets of values and different aesthetics. The culture of that world would probably demand that people not wear shoes or always cover their heads and never show their true faces. It would be a civilization completely alien to ours. Tomorrow’s world takes root in our present time, and is always connected to it. That’s why it doesn’t interest me to depict the world of the future. Two of my stories, entitled “Dress-Up” and “Travel” show characters with no hair on their heads. And yet these characters are not old men with bald heads. They are young people who shave their hair off. In the civilization portrayed in those two comic strips, that’s the way things go: it’s maybe part of the fashion to pretend to be old. I draw characters whose aesthetics are different from ours." 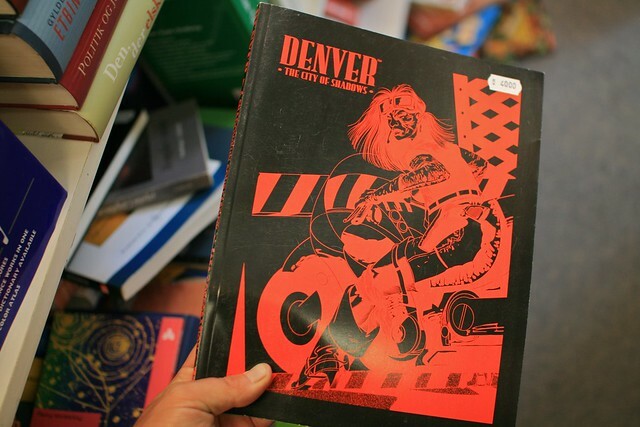 The paper argues that cyberpunk culture embedded certain notions ("global cities", cities as communication system, the importance of Los Angeles school of urban studies). It also highlights how urban planners can "understand the influence of a range of social theories on public understanding of planning issues". "Reading and discussing science fiction, whether cyberpunk novels or work from other thematic streams, will not help a planning student learn how to model transportation demand or a practitioner to write up findings on a conditional use application. Science fiction does, however, have the capacity to engage our imagination in thinking about present problems and future challenges, a heuristic function that derives from its willingness to take economic, social, and cultural patterns a step beyond their common sense extensions. Because the cyberpunk subgenre draws on ideas that ascribe power to technological change and global capitalism as all-encompassing forces, it offers relatively little direct guidance for planners. However, it does suggest the need for flexibility, for seeing plans as reflexive processes intended as frameworks for responding to inherent instability. It also suggests the value of creating opportunities for spontaneous and informal social institutions by loosening building codes, preserving low-rent commercial spaces, and making information infrastructures as ubiquitous and cheap as possible." Why do I blog this? Because of recent work about design fiction and urban futures. Moreover, it's important to think about the excerpt above beyond urban contexts (by replacing "planning" by other forms of social interventions). "The project Wandering through the Future reinserted such science fiction films into the public sphere from which they are normally banned. Clips from seventy movies were compiled into a sixty minute video, and screened in a shed modeled on the fortunetellers’ tents found in Sharjah souks. The compilation took viewers on a journey through popular cinema’s reservoir of scenarios for the future, ordered chronologically according to the date in which they are set, from 2008 until 802.701 AD. (...) An accompanying graphic timeline charted how far into the future the various films take us. The timeline made apparent that only very few science fiction films, produced in the optimism of the late 1960s and 70s, project their visions into a very distant future, and imagine a future reality that is desirable. But recent films all present apocalyptic scenarios, set in times that are increasingly near. They envision ecological and biological catastrophes, alien invasions, but most of all technological meltdown. " Why do I blog this? 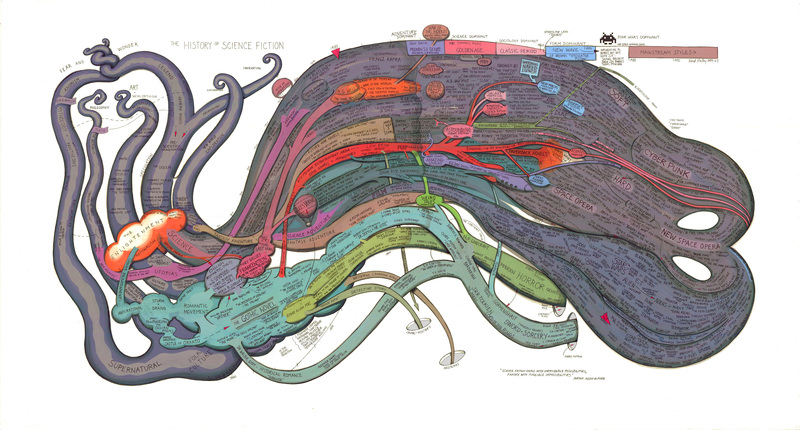 Timelines and graphical representation of sci-fi flourishes here and there. But this one is intriguing and relevant because it doesn't try to map everything. I like this stance. "Project Cybersyn was a Chilean attempt at real-time computer-controlled planned economy in the years 1970–1973 (during the government of president Salvador Allende). It was essentially a network of telex machines that linked factories with a single computer centre in Santiago, which controlled them using principles of cybernetics. (...) The principal architect of the system was British operations research scientist Stafford Beer." The idea was to have so-called "algedonic meters" in people's home, i.e. warning public opinion meters that would be able to transmit Chilean citizens's pleasures/displeasures to the government or television studio in real time. The government would then be able to respond rapidly to public demands based on these information, ("rather than repress opposing views" as proposed by Stafford Beer). "I think the image of the operations room looks like something out of 'Star Trek'or 2001. Whenever I show that image, people are stunned. Most people wouldn't associate that futuristic image with the Allende period in Chile. (...) the flat panel projection screens used a series of slide projectors located behind the wall that were attached to the armrests of the chairs. When you pushed a button on the armrest, it would change the slide on the screen. Each of these slide images was hand-drawn by some of Chile's top graphic designers. It looked like something that was real-time and highly automated -- but you have to remember, this was the 1970s." Why do I blog this? Another good example in the history of technologies that can be re-used in our work at Lift lab. The implementation of cybernetics in a context like this is quite curious and relevant if you think about more recent instantiations of feedback loops in the context of urban computing ("people as sensors"). Also, I find interesting to observe the system design and its link with SciFi in people's mind. It's fascinating to see how the balance between such a complex project (sensors in people's home, etc.) and the design of a chair to convey a synthetic appraisal of what has been sensed. There's a lot to dig here. Thanks Laurent Marti and Martin Wiedmer for the invitation! "There are also artistic reasons to look forward to an African science fiction renaissance. African storytelling tradition contains the very sort of metaphysical themes that science fiction is best equipped to address: themes of identity, self and community, and relationships between generations in time. There is no shortage of inspiration for science fiction within African life today, as the pervasive reach of technological development is being witnessed even by those in the most remote regions of the continent. Aesthetically, science fiction gives the writer power to create landscapes that blur the distinction between the literal and metaphorical interpretations of a story to produce an absolute representation of a complex idea. The writer can freely traverse the continuum of time, placing the present time in its right context by clearly framing it between the future and the past. This freedom could yield invaluable additions to the classics of African literature by tackling critical new issues while opening radical new dimensions to existing ones." As claimed by Fredrik Pohl "A good science fiction story should be able to predict not the automobile but the traffic jam". Just thought it would be good to play with a LOLtechnology such as graphjam to exemplify this quote. "The latest possible date a prediction can come true and still remain in the lifetime of the person making it is defined as The Maes-Garreau Point. The period equals to n-1 of the person's life expectancy. This suggests a law: Maes-Garreau Law: Most favorable predictions about future technology will fall within the Maes-Garreau Point. (...) Because the official “Future” -- that far away utopia -- must reside in the territory of the unimaginable, the official “future” of a society should always be at least one Maes-Garreau Point away. That means the official future should begin after the average lifespan of an individual in that society. Why do I blog this? referencing material for my book about technological failures/failed prophecies about innovation. "Challenge design orthodoxy and prevailing technological visions"
"Last year, the futurologist Stuart Candy visited the department and showed us a wonderful diagram he used to clarify how we think about futures. Rather than one amorphous space of futureness it was divided into Probable, Preferable, Plausible and Possible futures. One of the most interesting zones was Preferable. Of course the very definition of preferable is problematic — who decides? But, although designers shouldn’t decide for everyone else, we can play a significant role in discovering what is and what isn’t desirable. To do this, we need to move beyond designing for the way things are now and begin to design for how things could be, imagining alternative possibilities and different ways of being, and giving tangible form to new values and priorities. Designers cannot do this alone though, and many of the projects here benefit from collaborations, dialogues and consultations with people working in diverse fields such as ethics, philosophy, medicine, political science, fiction, psychiatry, economics, life sciences and biology. This space of probable, preferable, plausible and possible futures allows designers to challenge design orthodoxy and prevailing technological visions so that fresh perspectives can begin to emerge. It is absolutely not about prediction, but asking what if…, speculating, imagining, and even dreaming in order to encourage debate about the kind of technologically mediated world we wish to live in. Hopefully, one that reflects the complex, troubled people we are, rather than the easily satisfied consumers and users we are supposed to be." Why do I blog this? an interesting description of how design can contribute to futures research. 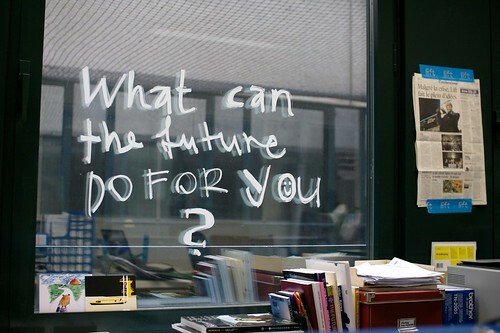 There's a lot of alternative ways to create similar account of the future. Think for instance about Future Feed Forward which looks like The Onion. But it's even more interesting when tools are made available to people who would want to create their own narratives with something like this The newspaper clipping generator (as a side note, I love their warning "Please do not use the names of real newspapers or persons"). After the story itself, the two authors (Daryl and Popcube) invited friends as guest to give their perspective on their work. 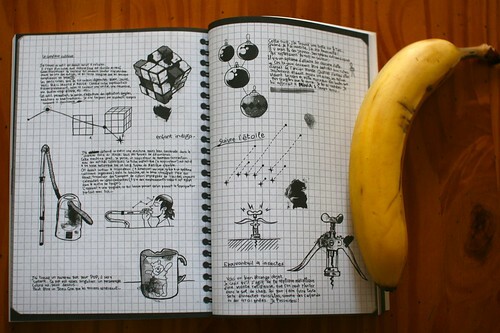 One of them, called Run, designed these two pages which show how artifacts from the past (a Rubik's cube, a vacuum cleaner, a Winnie-The-Pooh mug) were perceived by people from the future. The action takes place in a post-apocalyptic world in which - of course! - things from the past are no always available or in use because the industrial chain has vanished, because electricity is scarce and above all because people forgot about them. Each narrative (in French sorry) can be perceived as intriguing account of how people project a certain meaning based on surface characteristics: shapes, colors, characters, handles, etc. The Rubik's Cube is no longer understood as being a puzzle but the author shows how it is helpful to calculate using colored cubes and shape-shifting. At first glance, it looks very naive and done for the lulz but it's far more insightful than that; and I think undertaking this kind of activity is valuable for both design and futures research. This two pages should IMHO be a mandatory outcome of an exercise for my design students to force them thinking about affordances, form/function dialectics or research avenues. Besides, this example reminds me that I should really spend more time digging what Michael Shanks is doing at Stanford Humanities Lab because it may be close to this angle. Why do I blog this? looking for curious exercises to be done in workshops or during my courses next year. In sum, new representations of the urban futures I'm interested are mostly design fictions with the following characteristics: 1. They’re not only about the urban morphology, they’re also about invisible phenomena such as radiowaves or the city metabolism (e.g. with cell-phone usage), 2. A new asthaethic emerges from the digital culture (video games, web and mobile culture) and leads to curious metaphors and representations, 3. The territory itself is augmented and new layers of information/experience is added on top of existing places. Thanks YGM for the invitation! "Alvin Toffler warned us about Future Shock, but is this Future Fatigue? (...) The Future, capital-F, be it crystalline city on the hill or radioactive post-nuclear wasteland, is gone. Ahead of us, there is merely…more stuff. Events. Some tending to the crystalline, some to the wasteland-y. Stuff: the mixed bag of the quotidian. (...) Please don’t mistake this for one of those “after us, the deluge” moments on my part. I’ve always found those appalling, and most particularly when uttered by aging futurists, who of all people should know better. This newfound state of No Future is, in my opinion, a very good thing. It indicates a kind of maturity, an understanding that every future is someone else’s past, every present someone else’s future. Upon arriving in the capital-F Future, we discover it, invariably, to be the lower-case now. (...) The best science fiction has always known that, but it was a sort of cultural secret. When I began to write fiction, at the very end of the 70s, I was fortunate to have been taught, as an undergraduate, that imaginary futures are always, regardless of what the authors might think, about the day in which they’re written. (...) I wrote a novel called Virtual Light, which was set in 2006, which was then the very near future, and followed it with two more novels, each set a few imaginary years later, in what was really my take on the 1990s. It didn’t seem to make any difference. Lots of people assumed I was still writing about the capital-F future. I began to tell interviewers, somewhat testily, that I believed I could write a novel set in the present, our present, then, which would have exactly the affect of my supposed imaginary futures. Hadn’t J.G. Ballard declared Earth to be the real alien planet? 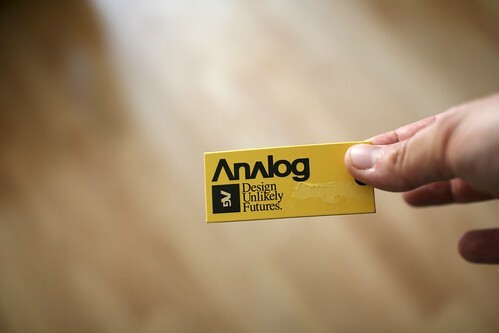 Wasn’t the future now?" Why do I blog this? some resonance with the theme of Lift09, these quotes are inspiring after a good discussion with Julian about design fictions.